Interested In Helping Out Friends of Niger? We at the Friends of Niger are looking for someone who can volunteer their time to help build our membership base. Join us, and be part of a small organization seeking to make a difference in the lives of Nigeriens. The more members we have, the more we can accomplish. We need your help now! Mercy Corps is giving special attention to Niger’s ongoing cycle of hunger in their fundraising efforts, calling it one of the world’s “Silent Disasters”. Long months of hunger between meager harvests hold Niger’s families in a brutal grip. Mercy Corps is helping them break free. Successive poor harvests put more than 3.5 million Nigeriens – about 20 percent of that country’s entire population – at risk for chronic malnutrition and other dire health problems. 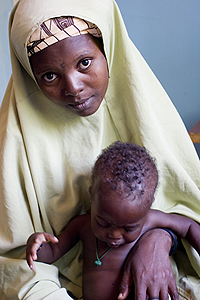 Children, already Niger’s most vulnerable population, have been most affected of all. Today, Mercy Corps is working to help determined Nigeriens build locally sustainable, resilient health and nutrition networks so that communities can cope with crisis – and mothers can provide a healthier future for their young children. Please take some time to look at the work Mercy Corps is doing in Niger and around the world. Grass roots organizations impacted by rate changes; sign the petition to bring back Surface Mail! On May 14, 2007 the USPS eliminated International Surface Mail which was used by many organizations and individuals to support meaningful, humanitarian projects around the world. A movement is underway to petition the US Congress to reverse this change. Please join us and sign the petition so that our collective voice can be heard. Click here for the latest edition of the Camel Express, including stories and news, from and about Niger.